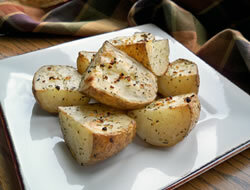 Wash, slice and cut potatoes into 1/2 in pieces. 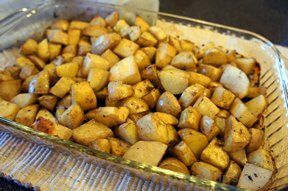 Arrange potatoes in a 9" square baking pan. 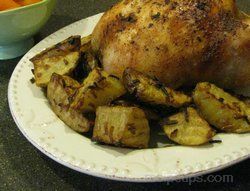 Sprinkle salad dressing over potatoes and place cut up butter on mixture. Sprinkle with Parmesan cheese. Bake uncovered at 375° for appox. one hour or until potatoes are soft. Stir two or three times while baking.